Louise Bryant was born in Reno, Nevada to a working class family. She moved to Portland, Oregon at the age of twenty, to attend the University of Oregon. It was there, that she wrote for a local newspaper and became active in the struggle for women’s rights, including the right to vote. In 1915, she met John Reed; she had heard of him before and had read his remarkable stories in the Metropolitan. She fell in love with the man who had written them. She wrote, “I felt as if I had been waiting for him all my life”. In New York, Louise began writing with her husband John in the Masses. At the imminence of the October Revolution of 1917, the couple rushed to Russia, and was directly involved in those events. They met and became friend of V.I. Lenin and other revolutionary leaders. 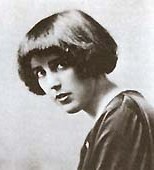 In 1919, Louise returned back to the United States to rally public opinion against the U.S. military intervention in the Soviet Russia, the Oregon Labour Press headlined: “Louise Bryant Talks to 4000 at Auditorium, An Enthusiastic Audience Hears Story of Russia from Home Girl”. Its report noted, “It has been a long time since any speaker in the Auditorium received the ovation extended her… time after time [“the crowd made up largely of working people but with a generous sprinkling of business and professional people”] rocked the magnificent public building with applause”. Louise and John were working side by side in the U.S. and back in Russia. They were in love with each other and with the Revolution. She was devastated by the early death of John. It took 4 years before she was able to continue her journalism. She went to Central Asia to continue her work. She interviewed the Turkish leader Enver Pasha and later reported the first interview by a non-Italian with the fascist dictator Mussolini. She married with a politician, soon divorced and continued her career as a writer, sculptor and political activist until her death at the age of 51, in Paris.